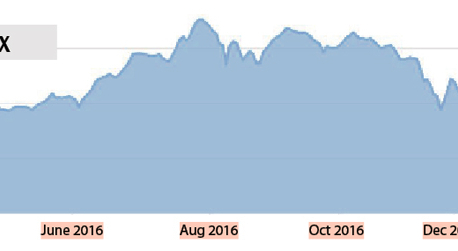 KATHMANDU, Dec 3: The Nepal Stock Exchange (Nepse) index jumped 131.01 points this week to close at 1,600.49 points on Thursday -- the last trading day of the week. The market ended in the green zone this week after logging loss in the past six weeks. The benchmark index posted gains this week despite of massive volatility in share prices throughout the week. Circuit breakers were triggered in two trading days this week due to drastic fall in share prices in the initial trading session. The market, however, recovered in the final trading sessions. The benchmark index was in a freefall in the last few trading weeks after bank and financial institutions (BFIs) started to tighten their margin lending amid liquidity crunch. Many analysts also say that the flow of rights and bonus stocks in the secondary market cause share prices to plummet. 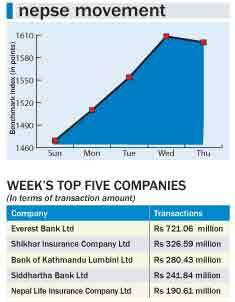 The market, however, started climbing upward after Nepse issued a statement aimed at soothing panicked investors. Many analysts also believe that rumors spread by some big investors that Nepal Rastra Bank (NRB) was increasing the ceiling of margin lending have also driven up the market. Some investors had met with Minister for Finance Krishna Bahadur Mahara on Monday to seek his support in propping up the bearish stocks. Following the meeting, rumors spread like a wildfire that the finance minister was positive about raising the margin lending ceiling. “Nepse's statement followed by rumors related to margin lending helped the stock market this week. This is an example of market manipulation," a stockbroker told Republica, requesting anonymity as his comment could jeopardize his relationship with the Nepse management. Sources say that Nepse issued statement following pressure from some big investors who lost money due to steep fall in share prices. However, Sita Ram Thapaliya, general manager of Nepse, told Republica that the statement was aimed at cautioning investors in the volatile market. Except Manufacturing and Processing, all trading groups ended in the green zone this week. Insurance group led the gaining side as its sub-index jumped up 772.22 points to close at 7,702.33 points. Hydropower group followed suit, logging gains of 157.39 points. Banking, the heavyweight trading group in the secondary market, rose 141.18 points to settle at 1,530.73 points. Development Bank group also ended 133.75 points higher at 1,650.42 points. Similarly, the sub-indices of Hotels and Finance groups went up by 42.11 points and 40.19 points, respectively, to end the week at 1,921.58 points and 766.02 points. 'Others' group also went up 18.8 points to finish at 753.12 points. Trading sub-index remained unchanged at 203.91 points this week. Manufacturing and Processing group, however, shed 29.93 points to close at 2,198.3 points. A total of 7.46 million units of shares of 152 companies worth Rs 5.83 billion were traded in the market this week through 31,336 transactions. The turnover went up by 15.02 percent this week compared to the last week. KATHMANDU, Feb 13: Nepal Stock Exchange (Nepse) index plunged 43.73 points, or 3.37 percent, on Sunday to close at 1,252.5 points.